Lots of free parking, theater-style seats in an auditorium. From the south on Route 17: Hollywood Avenue exit; left turn back over Route 17. Through the light,then to the top of the hill (flashing light). Turn right onto Franklin Turnpike. Left at the next light, onto Wyckoff Avenue. Right on Hopper Avenue. There is an entrance to the school (long ramp) on the right. There's also an entrance on West Prospect. 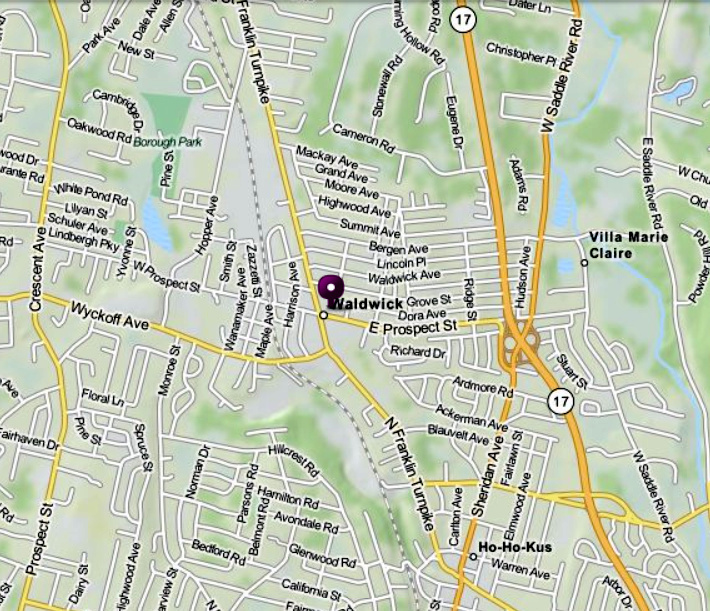 From the north on Route 17: Waldwick/Ho-Ho-Kus exit (Sherman Ave./Prospect Street) onto Prospect Street. 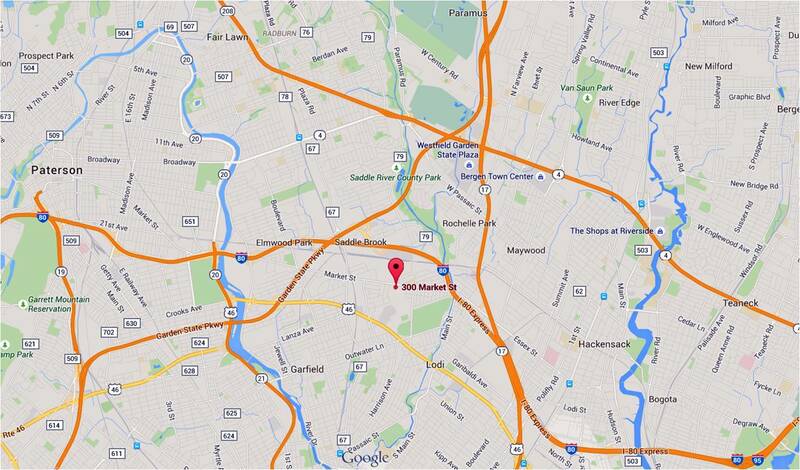 At next light, turn left onto Franklin Turnpike, then a block later, at the next light, right onto Wyckoff Avenue. Then follow the directions above. From Ridgewood: Maple Avenue north into downtown Ho-Ho-Kus, where it becomes (more or less) Franklin Turnpike. Go past the Hermitage to Wyckoff Avenue (traffic light). Turn left. (Turn right and you will destroy a hardware store.) At the second light, turn right onto Hopper Avenue. There is an entrance to the school before the next intersection. From Allendale: Go south on Crescent Avenue, past the Crescent School (our old location). Turn left onto Wyckoff Avenue. 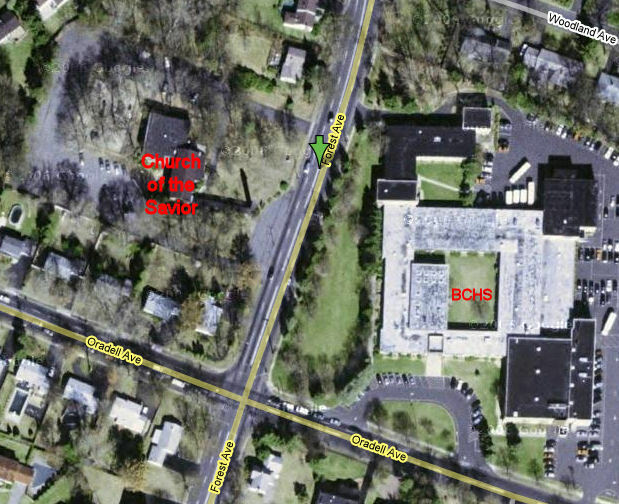 Go past the high school, turn left at the Hopper Avenue light. 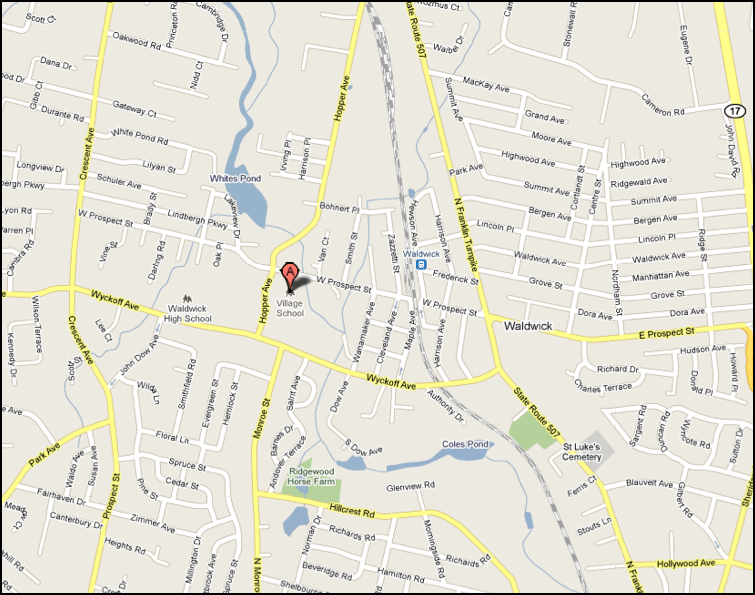 Or, from Crescent Avenue, you can turn left onto Prospect Street, and take that to the Village School. From the south on Route 17: Hollywood Avenue exit; left turn back over Route 17. Through the light,then to the top of the hill (flashing light). Turn right onto Franklin Turnpike. Left at the next light, onto Wyckoff Avenue. After first light, turn right onto Hopper Avenue. The amphitheatre is on your right after West Prospect Street. (Note: Prospect Street does not cross the rail line. From Allendale: Go south on Franklin Turnpike. After Orchard Street, bear right onto Chestnut Street. Chestnut Street becomes Hopper Avenue in Waldwick. The Amphitheatre is on your left just after the Waldwick pool. From the south on Route 17: Hollywood Avenue exit; left turn back over Route 17. Through the light,then to the top of the hill (flashing light). Turn right onto Franklin Turnpike. Right at the second light, onto Prospect Street. The Bank is immediately on your left. The Band plays in the parking lot behind the bank. 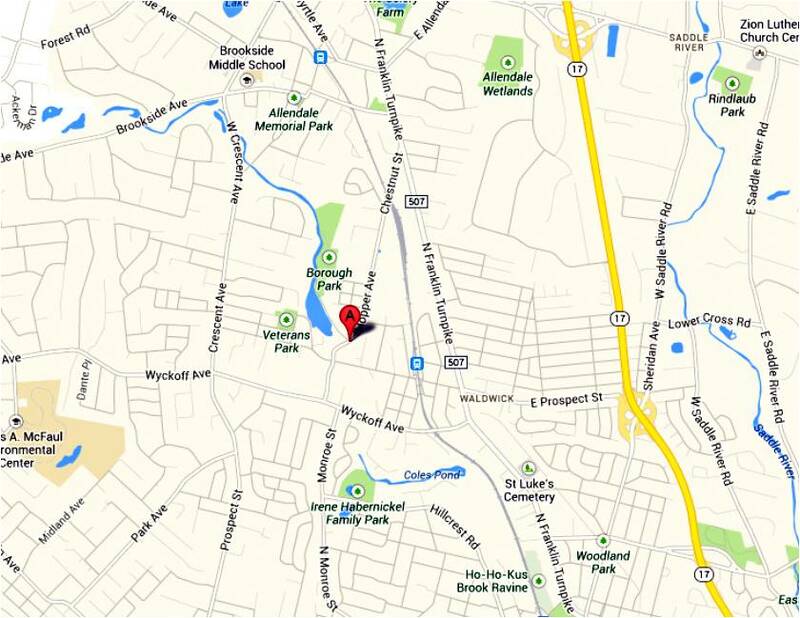 From the north on Route 17: Waldwick/Ho-Ho-Kus exit (Sherman Ave./Prospect Street) onto Prospect Street. The first light is Franklin Turnpike, and just before that, the Bank is on your right.The Band plays in the parking lot behind the bank. From Ridgewood: Maple Avenue north into downtown Ho-Ho-Kus, where it becomes (more or less) Franklin Turnpike. Go past the Hermitage to the second light, Right at the second light, onto Prospect Street. The Bank is immediately on your left. The Band plays in the parking lot behind the bank. From Allendale: Go south on Franklin Turnpike. Turn left onto Prospect Street. The Bank is immediately on your left. The Band plays in the parking lot behind the bank. Don't forget to please bring a chair! From Route 17: Ridgewood Avenue exit toward Ridgewood. 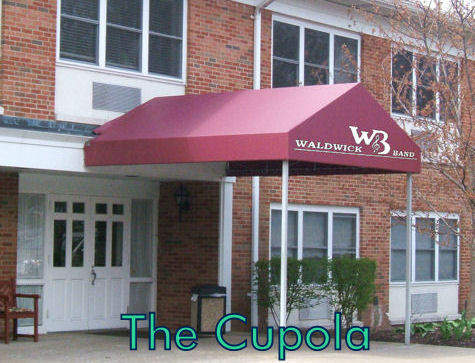 When the road straightens out, The Cupola is on your left. (If you get to the traffic light at Paramus Road (gas station/Commerce Bank), you've gone too far.) The entrance with the maroon awning (see photo) is closest to The Georgian Room where we rehearse. From Ridgewood: Go east on Ridgewood Avenue toward Paramus. Go through the traffic light at Paramus Road (assuming it's green). Stony Lane School is on your right, and The Cupola is right after it. The entrance with the maroon awning (see photo) is closest to The Georgian Room where we rehearse. 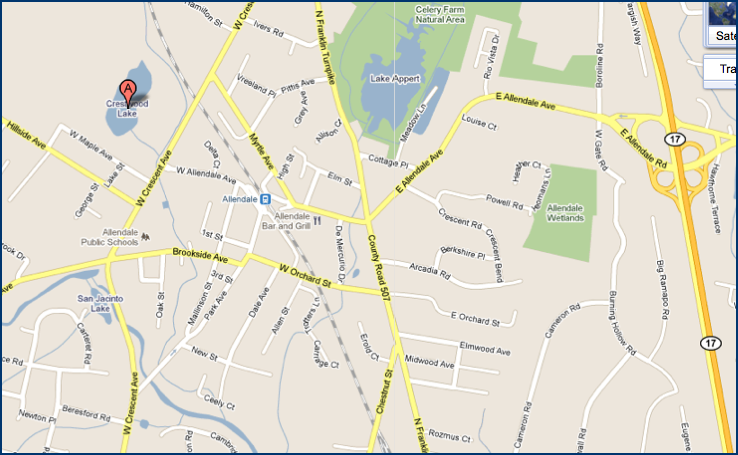 From Oradell: Oradell Avenue becomes Ridgewood Avenue just before the Garden State Parkway. Go over the Parkway, go over Route 17, follow the directions for Route 17 above. NOTE! This is a change for 2017: Band members can drive into the park but you cannot leave the park until after the fireworks are over and most of the pedestrians have left. Plan on staying 25-30 minutes after the fireworks end. If you don't wish to stay you may park across the street from the park entrance in the "first responders" parking lot next to the ball fields but you will need to print out a parking pass sent to all band members on our group email list. From the south on Kinderkamack Road: Head north to Hillsdale, turn right at the light onto Piermont Avenue (after Pascack Valley H.S.). Go to end, turn right onto Rivervale Road. Go 200 yards, turn left into the Town Hall complex (406 Rivervale Road). Park by the Library (the arrow on the map above). Walk down the hill to the amphitheater. 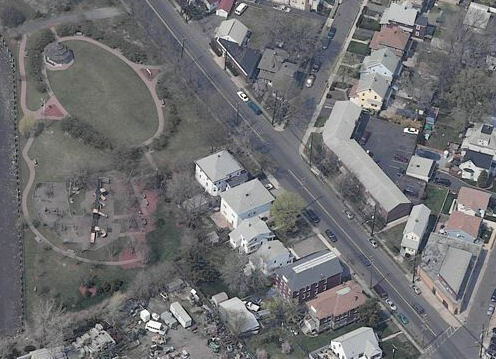 From The Cupola: East on Ridgewood Avenue over Route 17. Turn left onto Pascack Road (traffic light). Turn right onto Hillsdale Avenue at that traffic light. Go 2 miles through the center of town to Kinderkamack Road; turn left onto Kinderkamack, then right onto Piermont Avenue and follow the directions above. Kinder, gentler alternate from The Cupola: Go west on Ridgewood Avenue half a block to Paramus Road (Commerce Bank); turn right onto Paramus Road. Go over 17, past the exit onto 17 North, and immediately after it is Glen Avenue; turn right. The second light is Pascack Road, and this light has a left-turn arrow! (which the lights at Ridgewood & Pascack and Linwood & Pascack do not have). Go to Hillsdale Avenue, and follow the directions above. 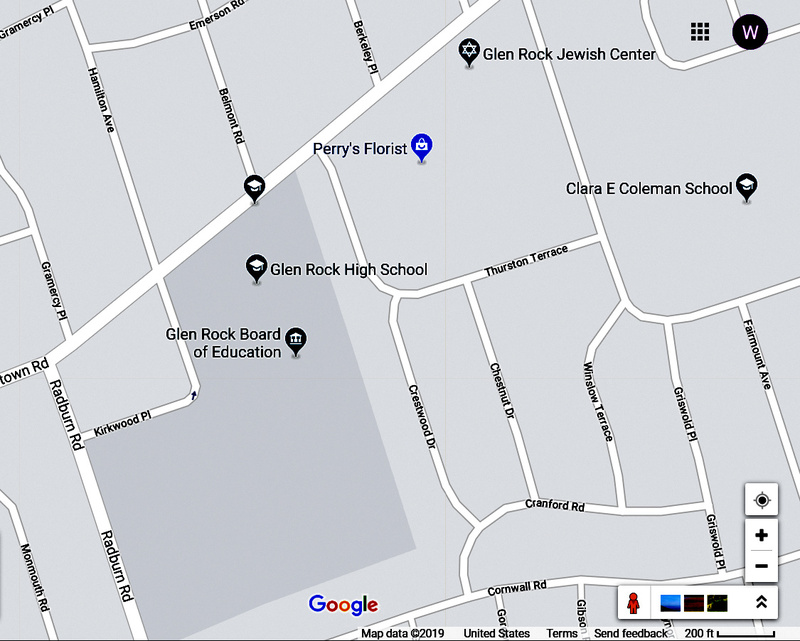 Musicians: Meet at 9 a.m. near the intersection of Radburn Road and Harristown Rd, near Glen Rock High School, at 400 Hamilton Ave in Glen Rock. 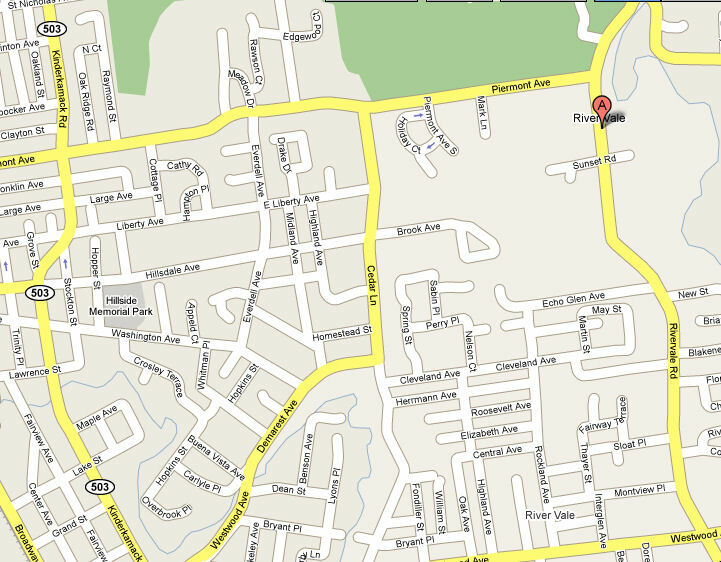 Radburn Rd is one block west of the High School. Park at the high school or on side streets. From Ridgewood: Maple Avenue south to Prospect Street. Turn left onto Prospect. Turn right onto Harristown Road. From Route 17: Midland Avenue exit, toward Ridgewood/Glen Rock. 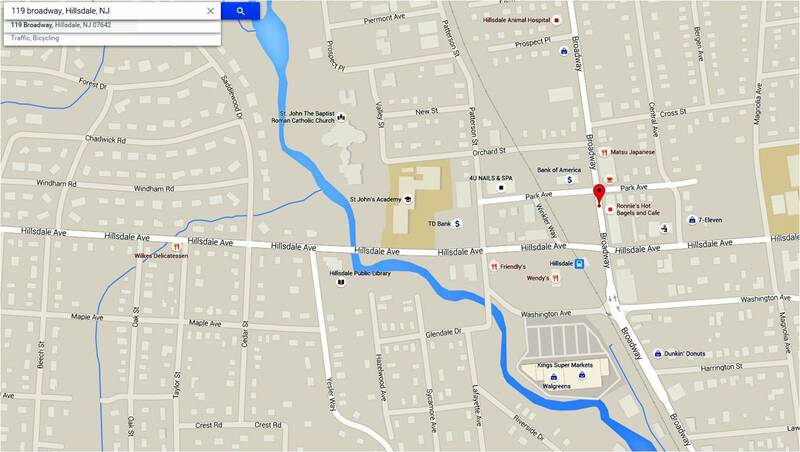 After Midland Avenue crosses Paramus Road (light), it becomes Grove Street. (It also becomes a speed trap, with police cars waiting for motorists going over 25 mph.) At Prospect Street, Grove Street ahead says "No Outlet," which must mean everyone pays full price, so turn left. After the power station and the mosque, turn right onto Harristown Road. Glen Rock H.S. is on your left. 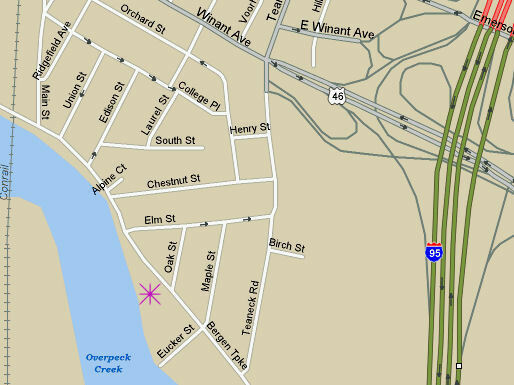 Take Teaneck Road (also known further north as LaFayette Road, Schraalenburgh Road, and Washington Street) south to its end. (You can pick it up from Route 4, I-80, US46, or most of the area's other east-west routes). 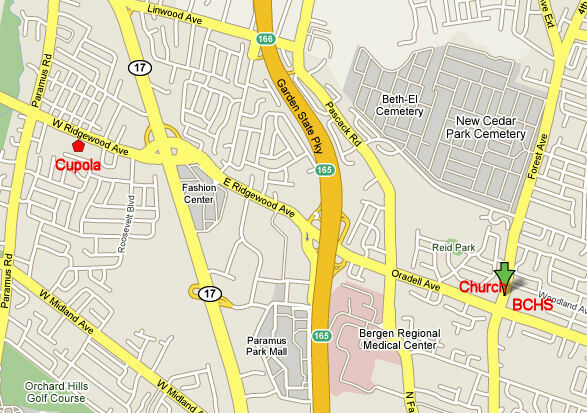 At the end of Teaneck Road, turn right onto Bergen Turnpike. Go 3-4 blocks, and McGowan Park is on your right. Use street parking; there's none at the park. next to the band shell offers ample parking. 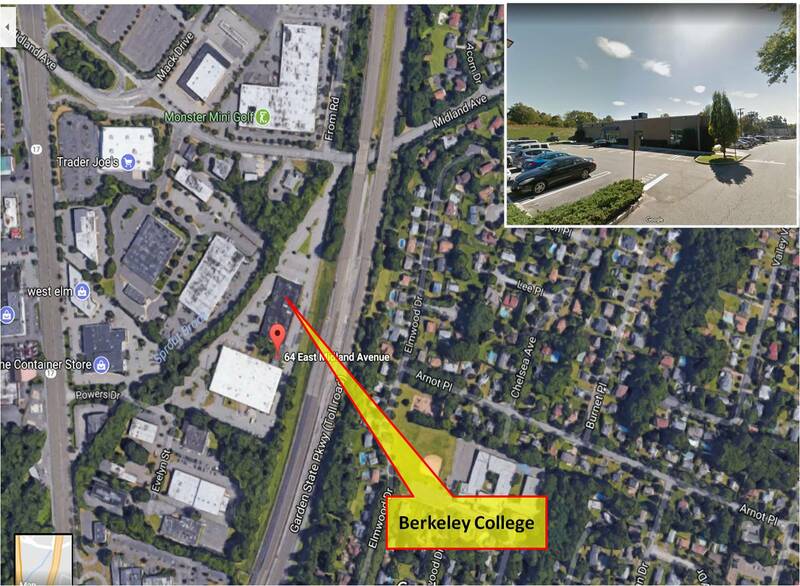 Berkeley College is on Midland Ave. between Route 17 and the Garden State Parkway overpass. People should park in front and go through the Berkeley College main entrance. Conference Room A is off to the right when they enter.